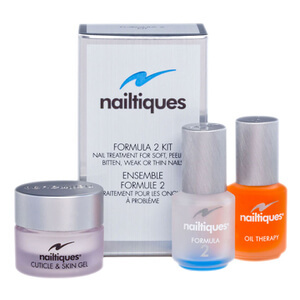 Treat soft, peeling, bitten, weak or thin nails with Nailtiques Nail Protein Formula 2. Consisting of a unique blend of protein and conditioners, the protein immediately acts to help bond nails that are splitting or peeling. 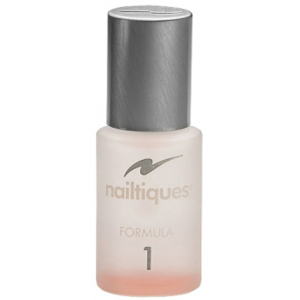 Created to treat different nail conditions, Nailtiques Nail Protein Formula 1, a salon-tested formulation, offers special combinations of ingredients which include hydrolysed keratin and protein in combination with gelatin and calcium to build a healthy nail foundation. The protein formula bonds the nail layers together building a strong nail foundation resistant to peeling, chipping and splitting. 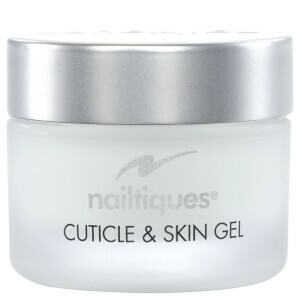 Nailtiques Nail Protein Formula is recommended for nails that are soft, peeling, split or just difficult to grow. When treated with Formula 2, you will see a marked improvement as it helps to strengthen the nail, resulting in long, strong and healthy nails. Formula 2 may be worn alone or with colour polish. I'd reverted to using Formula 1 as had received as gift but 4 nails are peeling again. Immediate improvement by applying Formula 2 on those specific nails. Reliable product that produces results. After reading lots of reviews for other products, I decided to try this after finally having my acrylics removed and being left with absolutely disgraceful...painful nails. It is pricey and you don’t get much for your money but it certainly seems to be helping strengthen my nails (what’s left of them!). I can only imagine how bad they would be without this! I am hoping that the benefits continue longer term so I can get good healthy nails back. 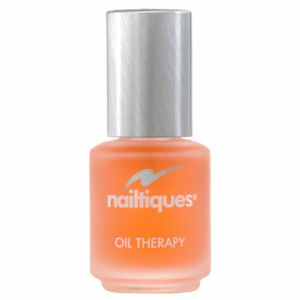 This is the best nail strengthened I have ever tried and believe me I have tried them all! It has transformed my dry splitting menopausal nails to their former glory in a few short weeks I can not recommend it highly enough. Have had soft:brittle & peeling for 3 yrs due to Anemia & ill health & had to keep my nails so short because they broke & peeled if they grew had tried many nail treatments with no success. A friend told me about Nailtiques 2 formula. Have now been using it for roughly 3mths, my nails are fantastic, grow & extremely hard it’s nice to be able to paint them again. I was sceptical if this product would work because every other product I have tried always made my nails worse with peeling. This product does work. It doesn’t chip and my nails are growing without peeling or splitting. It adds layers to the nail to imitate strength in nails. When I remove the product from my nails, my nails are still weak but I then just apply a coat every other day and my nails keep strong. Excellent product recommended by my beautician. Excellent service delivered super quick. I can honestly say that this product is amazing! I read all the reviews before I ordered it having tried many many different products, this was magic. Within two weeks my peeling nails became better. I have reccomended it to lots of my friends, all who have experienced the same results! My nails are now very strong for the first time in my life. Thank you so much! After using product for nearly two weeks I can honestly say I think this stuff really works! I can see a difference with my nails after wearing acrylic nails for 12 years my own nails were in a shocking state! Would definitely reccommend!